Join IBM Watson for a live walkthrough of our immersive AI experiences led by the creatives who designed it in our spatial experience design lab located in the Domain. 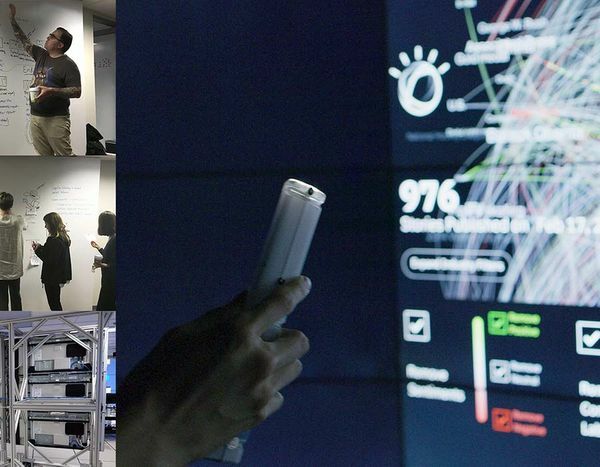 Our Immersive AI lab creates the experiences that transform our clients' ideas of AI at the Watson Experience Center. These centers are permanently branded experiences, with locations in New York City, San Francisco, and Cambridge. The centers are invitation-only, and their primary audience is potential customers of IBM Watson. The collaborative meeting space also serves as an educational hub for researchers, students, and media. Our lab has created a form of spatial exploration that allows humans to boost their abilities to comprehend data at scale and see how AI works. Blending storytelling with design, data, expert-guided interaction, and 93.3 million pixels we can make clear to clients and the world the value of AI and both its practical applications and potential for society. Meet the creative teams behind IBM Watson’s experiences and join us for a live walkthrough of recent work as we share our creative process and strategies. Stay for a Q&A with the IBMers on the team and design leaders from our partner agencies — Local Projects and Oblong Industries — hosted in the lab.